Kashima, 80 km east of Tokyo, is one of Japan’s most important ports. It is also at the southern end of a 65 km-long sandy beach that faces the high wave energy of the Pacific Ocean, which has an unbroken fetch of over 7000 km between Japan and North America. 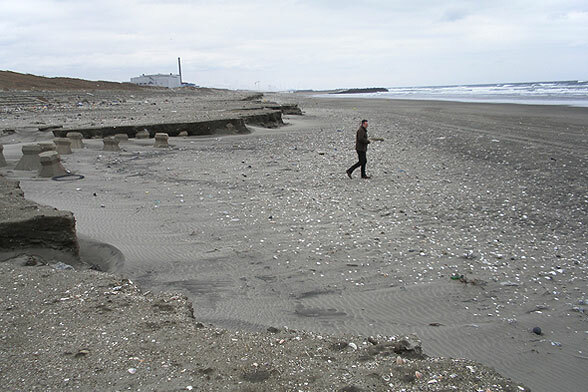 A succession of human interventions on Kashima beach renders it one of the most heavily engineered beaches in the world. Its problems started when a river was diverted from Tokyo Bay in the middle ages to reduce siltation. 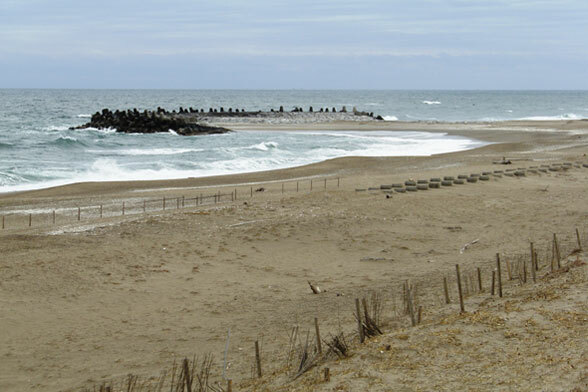 The river instead carried its sediment directly to the coast and helped build the Kashima beach. As the river mouth migrated south under longshore drift, the northern parts of the beach were left without a sediment source and began to erode. The Port of Kashima, which was developed midway along the beach, soon began to suffer from sediment accumulation from updrift. 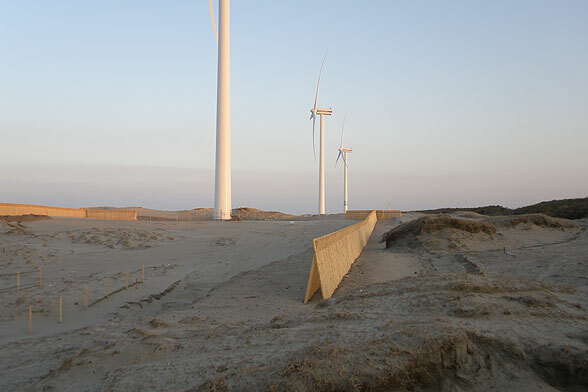 At the same time, wind-blown dunes supplied with sand from the beach began to migrate landwards across the coastal forest. A series of hammerhead groynes was constructed to try and halt the longshore losses of sand, and sand fences were built to trap the sand that was blowing landwards. 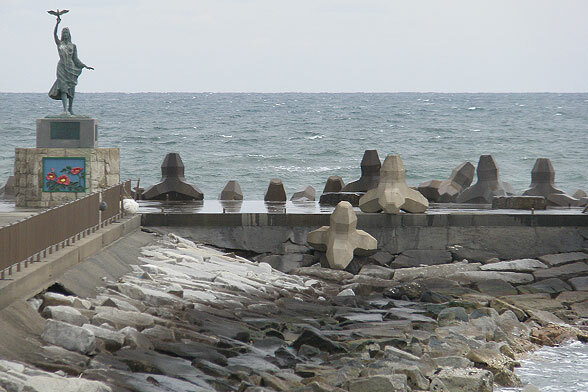 Wave energy on the beach is so great that even some of the massive concrete tetrapod blocks used in the construction of the groynes have been thrown landwards. The groynes not only failed to stop the erosion but have created dangerous rip currents. 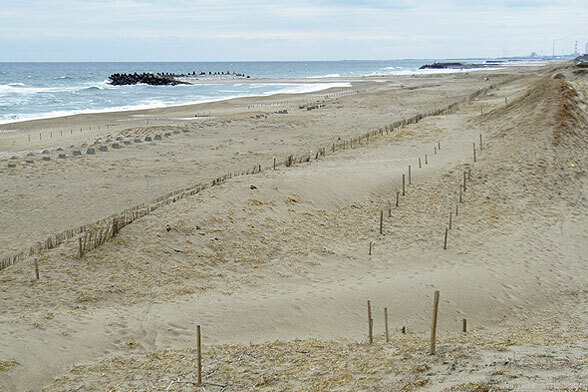 Subsequent efforts to stabilise the beach have involved constructing an artificial dune, placing concrete blocks and tetrapods on the beach itself and finally, beach nourishment. The nourishment material contains a high proportion of mud and where it has been eroded, an unsightly muddy scarp and localised deposits of mud have been left on the beach surface. The water, in the breaker zone, also as high proportions of suspended muddy sediments. The net effect of all of these interventions is to produce an unsightly beach that depends on continued human intervention to sustain it. The beach is a perfect example of one ill-conceived human intervention leading to many subsequent actions to try and remediate the original problems. The beach is also home to an engineering research pier to rival that of Duck, North Carolina. Regular measurements of waves, tide, sediment and seabed level are taken at the site. The photographs show several views of the beach including the hammerhead groynes, (some of which have been decorated with statues), beach armouring, dune fencing and nourished beach sections. They also show the sand fences in more detail, as well as one of the hammerhead groynes with a statue on top. You will notice that the most close-up photo shows two tetrapods that have been thrown over the structure by the waves.